The Primary environment is for children ages three to six years old. Practical Life – This area involves simple and precise tasks, based on the child’s previous observation and knowledge. The child learns to work on a task from beginning to end. The child develops movement and total concentration. The areas inside of Practical Life include care of self exercises, care of environment exercises, Grace and Courtesy Lessons, and the exercises of movement. The Practical Life area is the bridge between the home and the classroom. It is the keystone for the classroom and lays a foundation for what is to come. Sensorial Nothing is learned in the intellect that does not pass through the five senses first. It helps the child to order the impressions he has and helps the child to classify and clarify. This area of the classroom provides the opportunity for the child to explore each sense individually. Language is the expression of detailed descriptions of the child’s world. It aids development and gives the child keys to the past, the present, and the future. The whole classroom has language attached to it and is used every day. There are many varied opportunities for communication. The language area includes writing and reading. 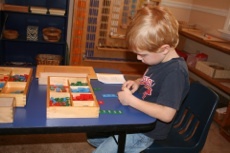 Math – The child has a mathematical mind and the need and ability for order, logic, sequence and grouping. Math is used in all areas of the classroom. 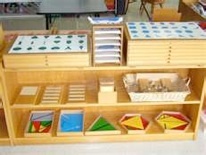 The child is able to manipulate the materials to gain a concrete understanding of each concept. The child learns the meaning of quantity first, and then the mathematical symbols that correlate with quantities given. Culture – Cultural education helps the child develop his own personality, adapt to his own culture, and become an independent, useful member of his society. Cultural materials provide individual activities, which help the child acquire knowledge in the areas of biology (botany and zoology), geography, history and science. Art – The general environment is full of art in many forms and the child learns through using the materials an appreciation for the art.